Measure two cups of steamed cauliflower into large colander or sieve and gently press excess moisture out. Place sea salt, green onion, parmesan and eggs to food processor and blend. Add cauliflower and pulse until cauliflower is broken into small pieces. 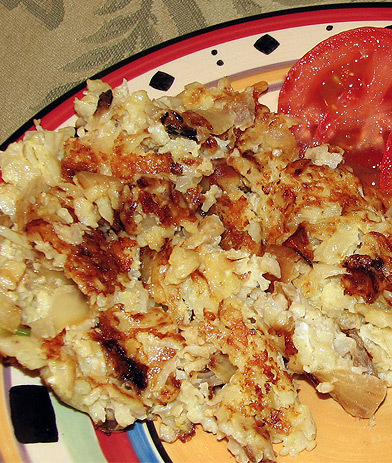 Add cauliflower mixture to hot griddle, spread out thin and cook for heat for 3-5 minutes until hash browns are caramelized on bottom and then gently turn them over to brown for 2-4 more minutes. Serve at once with eggs of choice... I like poached. This recipe was featured on our "Caulifower Show" on "Recipes For Life With Dr. Beth" - available for purchase on DVD.